One of two playable replicas of the original three octobasses Vuillaume made resides at the Musical Instrument Museum (MIM) in Phoenix, AZ. In the video below, MIM curator Colin Pearson gets us up close to the gargantuan bass, created, he tells us, to "add a low end rumble to any large orchestra." That it does. The description of the video just below advises you to "turn up your subs" to hear the demonstration by Nico Abondolo, double bass player of the LA Chamber orchestra. (Abondolo is also principle bass for several Hollywood orchestras, and he came to MIM to record samples of the octobass for the Hunger Games soundtrack.) As you'll see in the video, the octobass is so massive, it takes five people to move it. Abondolo plays the octobass with both his fingers and with the 3-stringed instrument's specially made bow, and demonstrates its system of keys and levers. "Playing the instrument is a twofold, or maybe threefold physical exertion," he remarks. It's also a journey into a past where "people were as crazy, or crazier about music than we are now." Perhaps needless to say, the instrument's bulk and the awkward physical movements required to play it mean that it cannot be played at faster tempos. And if the first thing that comes to mind when you hear Abondolo strum those low bass notes is the theme from Jaws, you're not alone. A number of other musicians visiting the octobass at MIM took the opportunity to goof around on the comically oversized bass and play their versions of the ominous shark approach music (above). You won't get the full effect of the instrument unless you're listening with a quality subwoofer with a very low bass response, and even then, almost no sub---consumer or pro---can handle the lowest pitch the octobass is capable of producing. 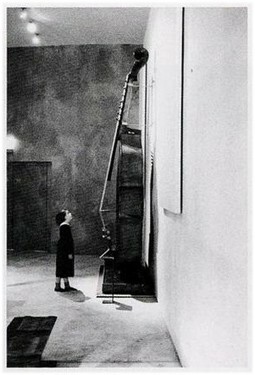 But if you were to stand in the same room while someone played the huge triple bass, you'd certainly feel its lowest register rumbling through you.